ahead of Tuesday’s album release with sales benefitting The Golub family. 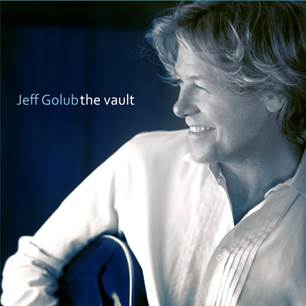 New York City (31 March 2015): A few days prior to New Year’s Day, the day guitarist Jeff Golub passed away at age 59, his frequent collaborators Steven Miller, Rick Braun and Bud Harner put the finishing touches on Golub’s 13th solo album, “The Vault,” a collection of previously unreleased songs and reimagined early career gems that were redecorated with the assistance of some of the artist’s high-profile musician friends. Everyone involved with creating the album that was released today by eOne Music – musicians, producers, songwriters, engineers, mixers, mastering, graphic artists, etc. – donated their time to the project so that all of the money generated by record sales can go to Golub’s family. One of the new cuts, “Open Up,” featuring the soulful Golub boisterously shredding over a trademark jazzy blues-rock groove produced by Jeff Lorber, debuted last week in the Top 20 of Billboard’s smooth jazz singles chart boding to become the next addition to the artist’s catalogue of No. 1 singles. “The Vault” is just the latest rallying of the music community to aid Golub, who succumbed to complications from Progressive Supranuclear Palsy (PSP), a rare, incurable and aggressive brain disease. Although he wasn’t officially diagnosed until last November, PSP stole his vision in the spring and summer of 2011. An all-star contingent played a sold-out benefit concert that autumn in Southern California to raise money to cover medical expenses. Golub’s motor skills rapidly began to deteriorate while touring in 2013 in support of his final set of all new material, “Train Keeps A Rolling,” and eventually left him unable to play his beloved instrument. After his passing, nearly two dozen prominent recording artists gathered January 21 near the guitarist’s New York City home to play a sold-out tribute benefit concert at B.B. King Blues Club & Grill. Many of the musicians who appeared on that high-wattage bill perform on “The Vault,” including Dave Koz, Kirk Whalum, Mindi Abair, Richard Elliot, Bill Evans, Philippe Saisse, Steve Ferrone and Braun. Additional album contributors were hitmen Gerald Albright, Brian Culbertson, Euge Groove, Boney James and Peter White. The ten-track “The Vault” consists of vastly different versions of seven Golub songs harvested from seminal album releases that were given a fresh twist by the guest artists personally selected by Golub; a soul-stirring live version of the Golub classic “Naked City”; and two previously unreleased selections, “Open Up” and the Saisse-produced “Swagster,” a sweltering swing sparked by Golub’s scalding guitar and Whalum’s impassioned sax wails. To help set the stage for “The Vault,” SmoothJazz.com hosted the world premiere of the record on March 28 along with interviews with the guest artists and producers. Last Sunday’s (March 29) episode of Koz’s radio show that airs nationally on SiriusXM’s Watercolors was devoted to the album spotlighted by interview segments with Abair and Braun, and played multiple tunes from the disc. On April 15, SiriusXM’s Watercolors will broadcast the entire Golub all-star tribute concert. Golub began his career as an ace guitar slinger alongside superstars Rod Stewart, Billy Squier, Peter Wolf and Tina Turner before launching his own chart-topping band, Avenue Blue, leading to his star-making solo career. The Akron, Ohio native is survived by his wife Audrey Stafford Golub, and sons Matthew (14) and Chris (12). For additional information about Golub, go to http://jeffgolub.com. January 21 all-star concert planned to memorialize the guitarist and benefit his family sells out. New York City (13 January 2015): When the newly blind guitarist Jeff Golub stumbled and fell onto New York City subway tracks where he was clipped and dragged by a train in 2012, New Yorkers came to his aid. When word spread throughout the New York City music community last month that Golub was on his death bed, New Yorkers bought concert tickets to the January 21 all-star benefit concert put together by Marquee Concerts and Smooth Jazz New York in order to raise money for Golub’s family. Although Golub succumbed to complications from a rare degenerative brain disease on New Year’s Day turning next week’s event at B.B. King’s Blues Club & Grill in Times Square into a memorial show, New Yorkers scooped up the remaining tickets to make sure the concert that will feature performances by more than two dozen luminaries sold-out to provide maximum assistance to Golub’s family. At the time of the subway scare, which was chronicled extensively in the New York media, Golub dismissed the incident that he was lucky to escape with only minor scrapes and bruises as “stupid blind guy stuff.” However, losing his vision the year before due to collapsed optic nerves turned out to be a harbinger of a far more serious problem for the Akron, Ohio-born musician who has called New York City home since the 1970s. Golub began struggling with his balance and speech during a 2013 national concert tour in support of his final album, the playfully titled “Train Keeps A Rolling,” that adversely impacted his ability to perform. It got to the point that management had to pull Golub off the road. The guitarist’s motor skills continued to deteriorate, but it wasn’t until last November that he was finally diagnosed with Progressive Supranuclear Palsy (PSP), an incurable and aggressive brain disease. Known for playing with soulful intensity and a bluesy touch, Golub’s diverse resume boasts longtime stints as a sideman to Rod Stewart, Billy Squier, Peter Wolf and Tina Turner as well as a 20-year solo recording career as a chart-topping contemporary jazz artist thus the lineup for the memorial benefit concert will present a multi-genre lineup of Grammy winners, nominees and hit-makers. Slated to take the stage are (in alphabetical order) Mindi Abair, Rick Braun, Randy Brecker, Henry Butler, Christopher Cross, Mark Egan, Richard Elliot, Bill Evans, Steve Ferrone, Euge Groove, Dave Koz, Chuck Loeb, Chieli Minucci, Philippe Saisse, Kirk Whalum and over a dozen more musicians. Last Thursday (January 8), Whalum presided over Golub’s funeral held at the New York Society for Ethical Culture where a throng of artists and the city’s busiest session players gathered to pay tribute to the late guitarist, his wife Audrey Stafford Golub, and sons Matthew (14) and Chris (12). Among the many performers filling the ceremony with heartfelt song were John Waite, Marc Cohn, Whalum and Cross. For more information about the memorial concert produced by Marquee Concerts, please visit http://marqueeconcerts.com/events/jazz and for additional information about Golub, go to http://jeffgolub.com. 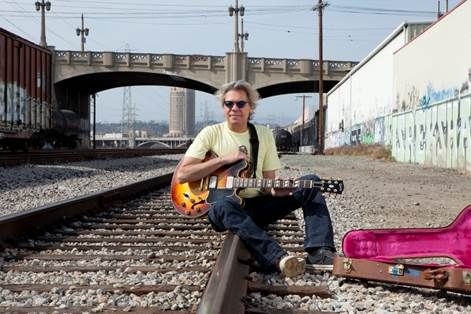 Port Washington, New York (17 July 2013): It’s been a helluva two years since guitarist Jeff Golub released his last album, “Three Kings,” which paid tribute to blues legends B.B., Freddie & Albert King. As the record was released, the optic nerves in Golub’s eyes inexplicably collapsed leaving him blind. Adjusting to his new life meant adopting Luke, a guide dog. While attempting to catch a New York City subway last September, Golub fell onto the tracks as a train rapidly approached. He was clipped and dragged by the train as Luke and bystanders frantically attempted to help. Miraculously Golub escaped the harrowing and what could have been a fatal ordeal with only minor scrapes and bruises. Undaunted and as boisterous as ever, Golub stands defiantly, toting his guitar with Luke perched at his feet, at the crossroads of train tracks on the cover of his aptly titled new album, “Train Keeps A Rolling,” which will be released August 13th by Entertainment One Music. Golub’s 12th solo album had to be something special and have a lot of soul. At the suggestion of his manager, Bud Harner, he teamed with British keyboard great Brian Auger for a rollicking 11-song collection of soul, jazz, blues and rock combining Golub’s raw bluesy guitar licks with Auger’s hallmark Hammond B-3 organ. Golub produced the set with Harner, a Grammy-nominated producer who shared production duties with Golub on the guitarist’s five most recent records. Anchoring the grooves were steady-as-a-rock drummer Steve Ferrone, who was an original member of the acclaimed jazz-rock ensemble Brian Auger & The Oblivion Express, and bassist Derek Frank, who also had a history playing with Auger. Augmenting the tracks were percussionist Luis Conte and a lively horn section comprised of Mindi Abair (alto sax), Nick Lane (trombone), Dave Woodford (baritone sax, flute) and Steve Madaio (trumpet). Making guest appearances on the vocal selections wereChristopher Cross, Ambrosia’s David Pack and Alex Ligertwood, who was also an original member of The Oblivion Express. A Copley, Ohio native who has called New York City home ever since he launched his career in the early 1980s, Golub began as an in-demand sideman who enjoyed long stints touring and recording with Billy Squier and Rod Stewart as well as Tina Turner, Peter Wolf, John Waite,Vanessa Williams, Gato Barbieri and Bill Evans. 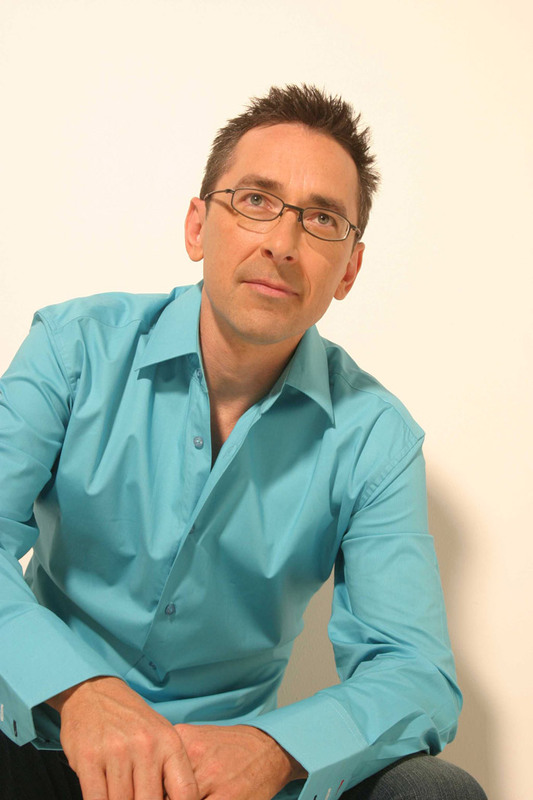 He released his debut album as a band leader in 1988 and went on to record an impressive string of chart-topping albums and radio hits with Avenue Blue and as a solo artist that made Golub a radio staple, perennial fan favorite and consistently strong concert draw in the contemporary jazz stratosphere. 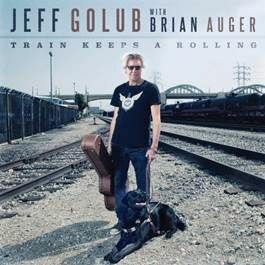 Additional information and a list of tour dates that Golub will play with Auger in support of “Train Keeps A Rolling” are available at www.jeffgolub.com. Brian tells me his story during our interview. CLICK TO FOLLOW BUTTON. LIKE THE FACEBOOK PAGE PINK AND BLUE NOTES. FOLLOW US ON TWITTER @Pink_BlueNotes. 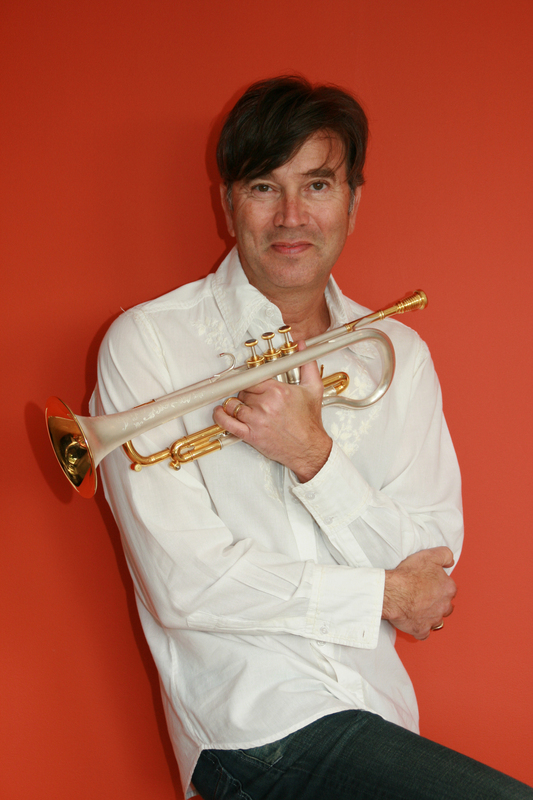 Rick Braun has been entertaining us for many years with his chart topping award winning hits. He’s collaborated with some of the best to bring us songs like “Shake it Up” with Boney James which won the Best Collaboration Award. His work with Richard Elliott in “RNR” went to #1 on the Billboard Contemporary Jazz Chart. It’s no surprise that he’s a much sought after producer. He’s definitely proven that he has what it takes. Rick is skilled in more than just one area of music which makes him versatile as an artist. He’s a vocalist who was once a back-up singer for artists like Rod Steward, Sade, and Tina Turner. That’s something that most people probably wouldn’t know. 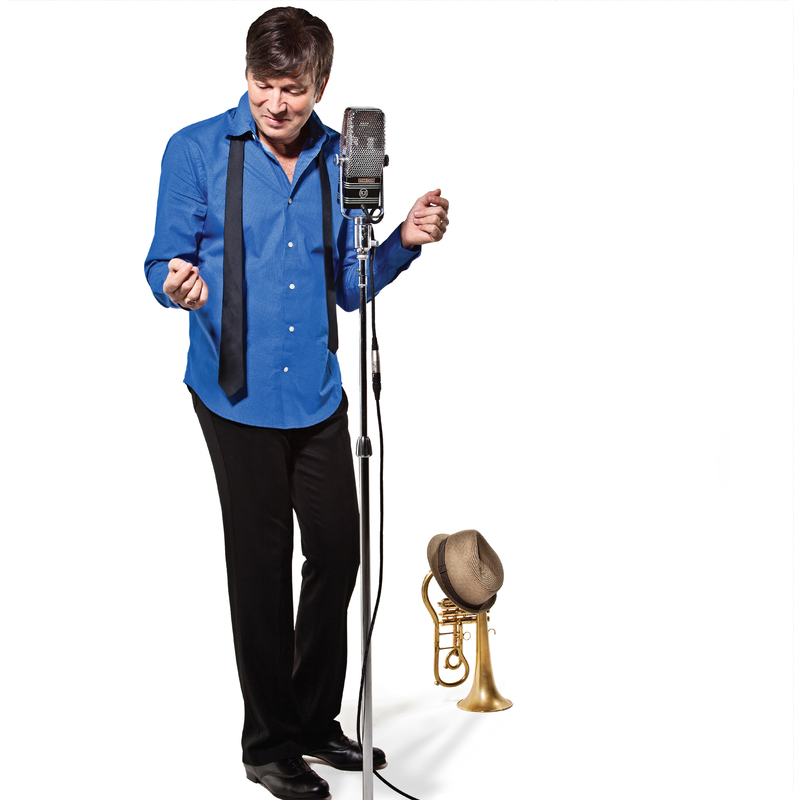 Now he’s chosen to display his vocals on his latest project titled “Rick Braun Sings With Strings.” He covered songs that we all know and love such as “Time After Time,” and some we may not be as familiar with like “Once Upon A Summertime.” Rick created a project that would beautifully display his trumpet playing skills, as well as his vocal abilities. Rick tells me all about it. CLICK FOLLOW AT THE TOP AND/OR BOTTOM OF THE SCREEN. LIKE OUR FACEBOOK PAGE PINK AND BLUE NOTES. FOLLOW ON TWITTER @Pink_BlueNotes. “Feels Like Home,” his first major release as a frontman. Tampa, Florida (4 June 2013): In the midst of graduation season, it seems like the ideal time for the release of long-time sideman Mike MacArthur’s first major recording on center stage. The saxophonist’s 10-song “Feels Like Home” was released today by Paradise Point Music. On the collection produced by Grammy-nominee Brian Bromberg, MacArthur graduates surrounded by his scholarly musician friends on the set comprised of soulfully performed jazz standards and alluring originals. “Feels Like Home” sounds live. MacArthur describes it as “real players making real music on real acoustic instruments.” Playing the music of the masters such as Duke Ellington (“In A Sentimental Mood”), Miles Davis (“Jean Pierre”), Sonny Rollins (“Blue Seven”) and Joe Zawinul (“Birdland”), MacArthur, bass prodigy Bromberg, Ron Reinhardt (piano, B-3 organ) and Frank “Third” Richardson (drums) formed the core quartet that features spotlight soloing from contemporary jazz maverick Jeff Lorber on piano, Rick Braun on trumpet and flugelhorn, and Jeff Golub on guitar. Journeyman percussionist Alex Acuna decorates and texturizes the tracks. MacArthur graciously gives his friends permission to uncork their finest vintage of improvisational jazz. 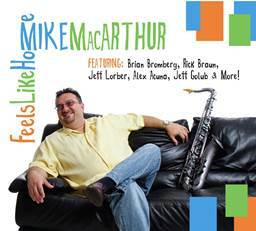 Throughout the album, MacArthur’s sax play is dexterous, precise and efficient. He plays just enough notes to convey the song and solos with just enough pizazz to get his point across. 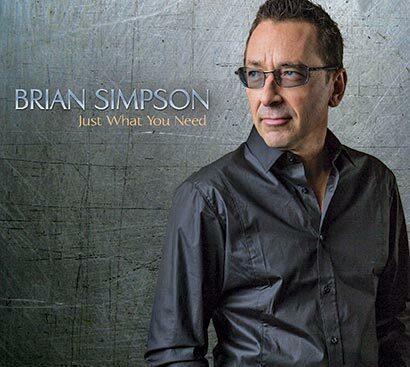 Having performed with a bevy of marquee musicians as a sideman throughout his career, including with Bromberg, Braun and Golub, he wants the release of “Feels Like Home” to signal the start of a new chapter. Setting the bar high in terms of performance, production, and composition, MacArthur’s stride into the spotlight is smartly executed with confidence, poise and a whole lot of soul. After recently opening for superstar Queen Latifah, MacArthur will lead his own band at Uptown Altamonte near Orlando, Florida on June 15th sharing the bill with guitarist Nils and will open for guitarist Peter White on July 21st at Glenora Wine Cellars in Dundee, New York. Additional information about MacArthur is available at http://www.mikemacarthur.com.